50' Carver motor vessel | Christian & Co. The vessel was inspected while hauled. Hull construction material is molded fiberglass. Deck is constructed of molded fiberglass and above deck structures are constructed of molded fiberglass. Bulkheads are constructed of plywood. Overall condition of the hull structure appears to be in as built condition. The vessel’s weight is 40,000 lbs. * Exterior rails and hardware appear properly arranged and installed. Cosmetic condition of vessel appears good externally and good internally. Vessel’s external colors are white topsides, black and gold accent stripes, black anti-fouling paint, white particle decks, white vertical surfaces. Below waterline through hull fittings appear marginal, the through hull fittings (3) located in the rudder port bilge area exhibit significant corrosion and are at the end of their service life. The engine intake through hull valves are frozen in the open position. The vessel is equipped with three electric/automatic bilge pumps that appear satisfactory and the bilge is clean and holding approximately two gallons of diesel fuel. The ventilation system consists of two blowers and natural ventilation and appears satisfactory. General housekeeping appears good. The condition of the coring, in the stringers, deck, and elsewhere as applicable, is beyond the scope of this inspection. Engine external surfaces appear good and exhibit no significant rust, oil or coolant leaks. Engine hour meters exhibit P – 725 and S – 722 hours. Motor mounts appear good. Cooling systems appear good. Fuel systems and components appear good. Exhaust systems and components appear good. Electrical system and components appears good. Engine control systems appear good and shaft logs appear satisfactory. The starboard shaft log exhibits slight leakage residue below shaft log. Steering control systems appear satisfactory and rudder ports appear satisfactory. Propulsion components appear satisfactory, however the starboard propeller shaft dripless packing gland exhibits water stains below the fitting and is possibly leaking. Generator surfaces and motor mounts appear good. Generator’s peripheral components and systems appear good although the external coolant reservoir is low on coolant. 890 hours on meter. Waste systems and components appear good. General service seawater systems appear satisfactory, however the generator exhaust hose and air conditioner intake hose are cracked and beyond their service life. There is 688 gallon capacity in four metal tanks. Two are located port and starboard outboard of engines and two are located below aft cockpit. Fuel tank surfaces, as visible, appear good and the securing mechanism appears good. The fuel fill, vent, feed and return lines and components appear satisfactory as visible. Fuel shutoff valves are located at the fuel tank distribution manifold and appear satisfactory. The AC shore cord, inlet and connections appears satisfactory although the inlet exhibits burning. The AC wiring and outlets appear satisfactory. The AC main feed is protected with circuit breakers. Battery arrangement appears satisfactory although batteries are not stored in vented plastic boxes. Batteries are equipped with disconnect switches. DC wiring appears satisfactory. Circuit protection for the AC and DC branch system appears satisfactory. Wire terminations and connections appear satisfactory. Wire organization and arrangement appears satisfactory. Vessel has three portable fire extinguishers with unknown certification. Vessel has one fixed fire suppression system with expired certification. The safety components include: sixteen PFDs and two throwable PFDs; distress flares with expired certification; no life rafts; one plow type anchor with chain and line and appears satisfactory. Navigational and anchor lights appear properly arranged, installed and functional although the steaming light did not function. The vessel was inspected at its normal slip location. The vessel is a production built fiberglass cockpit motor yacht equipped with twin diesel inboard engines. The vessel was built in November of 1998 by Caver Yachts. The vessel was inspected while hauled for routine maintenance. The engines, generator and related machine systems were not test operated. The vessel ownership history is unknown. The vessel maintenance history is unknown. The vessel appears to be in as built structural condition and good cosmetic condition. No statements were given in regard to any previous events in the vessels history such as collision, grounding, submersion, fire, insurance claim, etc. Upon completion of the recommendations the vessel is suitable for its intended use as a coastal cruising motor yacht. 1. Both port and starboard trim tabs are at the end of their service lives. The stainless steel surfaces about the zinc anodes have failed. The trim tabs are fastened to the transom using self tapping machine screws. Most machine screw heads have sheared off. The trim tabs should be through bolted to the transom. Have a qualified marine technician service the port and starboard trim tabs as needed/necessary. 2. The transom below water level light exhibits salt crystallization visible through the exterior lens. It appears that this salt crystallization is the result of a leaking through hull seal connection. Service the light/through hull fitting as needed. 3. The below water through hull fitting external strainers exhibit moderate marine growth. Clean/service the external sea strainers as necessary. 4. Several areas around the below water through hull fitting exhibit a halo effect/anti-fouling paint failure. Service as needed. 5. The bow thruster exhibits moderate marine growth and the zinc anode is near the end of its service life. Service bow thruster/anode as needed. 6. 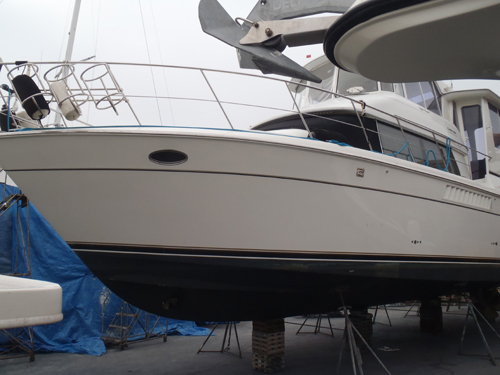 Hull bottom anti-fouling paint is thin/failing in multiple areas. Service the hull bottom anti-fouling paint as needed. 7. Provide current visual distress signal flares as required by federal regulations. 8. The four batteries located forward below the V-berth are not properly stored in vented plastic boxes as recommended by A.B.Y.C. The batteries appear to be leaking fluid. Have a qualified marine electrician inspect and service the batteries as needed. 9. A significant amount of diesel fuel (two gallons) was seen in the centerline bilge area. The origin of the fuel is unknown. Remove the fuel and clean the bilges to facilitate the detection of any possible fuel leaks. 10. Both port and starboard engine intake through hull valves are frozen in the open position. Have a qualified marine technician service as needed. 11. The generator exhaust hose visible forward of the exhaust muffler is cracked and at the end of its service life. Have a qualified marine mechanic inspect the generator exhaust system and service if/as necessary. 12. The bilge area located on centerline in the aft stateroom exhibits standing water – approx. two quarts. The drain plug located in the area is corroded and beyond its service life. Remove or replace as needed. 13. The two intake through hull valves and fittings for the AC unit exhibit significant corrosion. The port through hull valve is frozen. Have a qualified marine technician inspect and service all through hull fittings and valves as needed/necessary. 14. The two air-conditioning intake hoses located on centerline in aft stateroom bilge are cracked and beyond its service life. Inspect and replace the intake hoses as needed/necessary. 15. The forward (steaming light) did not function. Prove all navigation lights functional as required by federal regulations. 16. Both the port and fixed fire fighting systems have not been inspected and tagged as recommended by N.F.P.A. Provide adequate inspected and tagged fire fighting equipment as recommended by N.F.P.A. and required by federal regulations. 17. The shore power inlet exhibits burning. Have a qualified marine electrician inspect and service the shore power inlet if/as needed. 18. The starboard propeller shaft log exhibits water stains below the shaft log and is possibly leaking. Have a qualified marine mechanic inspect the shaft log and service if/as necessary. 1. The generator external coolant reservoir is low on coolant. 2. The knotmeter paddlewheel/transponder exhibits moderate marine growth. Service as necessary. 3. The interior bow thruster machine system(s) are not accessible.